This article is a short summary of Kirby: Triple Deluxe. 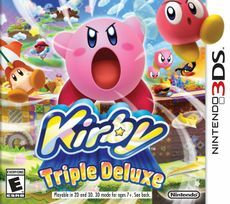 Kirby: Triple Deluxe is a 2D platforming game and the thirteenth game in that style in the Kirby series, released for Nintendo 3DS in 2014. The game places an emphasis on the 3D aspect of the Nintendo 3DS, making extensive use of the system's features and effects. After the release of this game, two of the game's side modes would receive full releases as Nintendo eShop titles: Kirby Fighters Deluxe and Dedede's Drum Dash Deluxe. Devour trees, obstacles, and huge chunks of stages with Kirby’s Hypernova ability and inhale enemies to copy epic new moves like Archer. It’s a grand new Kirby™ adventure PLUS a new multiplayer battle mode, Kirby Fighters! When Kirby wakes up one morning, he finds that his house has been lifted into the sky by a giant beanstalk. He rushes out of the sky, only to fall down onto Castle Dedede, which has also been lifted up. Storming the castle, he finds a mysterious, six-armed being named Taranza kidnapping King Dedede. Kirby chases Taranza up the beanstalk into the floating kingdom of Floralia to save Dedede and return Dream Land to normal. General gameplay is similar to Kirby's Return to Dream Land. One of the key differences with this game, however, is the interactivity with the background: certain enemies will attack from background areas, certain items allow Kirby to damage enemies and interact with objects in the background, and by using the 3D Warp Star Kirby fly between the background and foreground. In addition to the new Copy Abilities, the player will occasionally find a special Miracle Fruit which gives Kirby the special Hypernova ability, allowing Kirby to inhale larger objects that he normally cannot. This ability is similar to the Super Abilities from Kirby's Return to Dream Land, in that it is required for solving various puzzles. Kirby progresses through stages using a world map system. Within each stage are three Sun Stones, which must be collected to unlock the boss stage of each world. Also available in each stage are Keychains, collectibles which depict sprites of characters, items, or objects from past Kirby games. In addition to the main game, various other modes are also available, some only unlocked after finishing the game. Among these are Kirby Fighters, a fighting game similar in style to Super Smash Bros.; Dedede's Drum Dash, a rhythm game featuring King Dedede; Dededetour!, a mode in which players play the main game as King Dedede; and The Arena and The True Arena, the boss rush modes. This page was last edited on 19 November 2017, at 05:56.